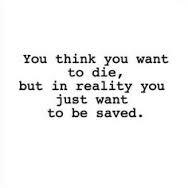 While I was looking for something to illustrate the last post, I came across this, and it struck me, as someone who was once suicidal, how true it is. It’s not dying you crave, it’s freedom from the unbearable emotional pain, and dying seems the only way out. The last resort, because you just can’t take one more minute of feeling this incredibly horrible. Something to think about.